A. Perlman was Abraham Perlman (1869-? ), an immigrant from Russia who started an ornamental brass factory at 81 Mangin St., New York, in 1901. He appeared in the 1900 U. S. Census, age 33, as a brass finisher living at 379 E. 10th St., Manhattan. His naturalization petition, 16 March 1911, stated that he was born 15 July 1869 in Minsk, Russia, that he emigrated from Rotterdam 20 June 1893 and that he arrived in the port of New York 5 July 1893. The brass works on Mangin St. became A. Perlman Iron Works at 1735 West Farms Rd., the Bronx, in 1909. This ad appeared in the Real Estate Record and Builders' Guide, December 1912. The business stayed at this address almost 40 years, moving to 1059 Washington Ave., the Bronx, in 1948. They were in business at this address another 40 years, finally closing in the late 1980s. This ad appeared in the journal, Architecture and Building, vol. LII, no. 12, December, 1920. It shows the Warren & Wetmore Park Avenue Viaduct running around Grand Central Station, and credits A. Perlman with executing the iron work. Abraham Perlman's 1911 naturalization petition was signed by two witnesses, Francis J. Berman (ca.1880-?) and William Bogen (1867-1927). These gentlemen, like Perlman, were immigrants from Russia and may have been related. William Bogen, his brother, Samuel Bogen (1871-1940), and Abraham Perlman all lived at 985 Aldus St., the Bronx, in 1915. William Bogen and Francis Berman were partners in a company that manufactured umbrellas, known initially as Bogen, Berman & Co. and later as Bogen, Berman & Fox. These were in business approximately 1908 to 1926. But William Bogen and Samuel Bogen were also officers at A. Perlman Iron Works. William Bogen was listed as president of A. Perlman from 1915 to 1918, and Samuel Bogen was secretary from 1908 to 1917. Francis J. Berman was also a partner with William Bogen at the Milton Watch Co. in the early 1920s. In census reports Francis J. Berman identified himself as a lawyer in 1920 and 1930, then as proprietor of an upholstery business in 1940. In the 1925 New York State Census he was an umbrella manufacturer. William Bogen was a silversmith in 1900, umbrella manufacturer in 1910 and 1915, and real estate salesman in 1925. Samuel Bogen consistently identified himself as a clothing salesman in census reports spanning 1900 to 1930. Another figure at A. Perlman Iron Works was Abraham Perlman's son, Sol Perlman (1901-1977). His obituary in the New York Times, 7 April 1977, read, "Sol Perlman, a manufacturer of ornamental iron, died yesterday at Lenox Hill Hospital. He was 75 years old and lived at 40 East 84th Street. Mr. Perlman, an engineering graduate of Cornell University, was head of A. Perlman Iron Yorks [sic], 1059 Washington Avenue, the Bronx, manufacturers of miscellaneous iron construction, such as staircases and railings. He was also active in philanthropic affairs and had been a director of Bronx-Lebanon Hospital. He leaves his wife, the former Eve Golembe; two sons, Alan and Barry; three sisters, Ethel Hirsch, Belle Robinson and Gertrude Lamson, and five grandchildren." 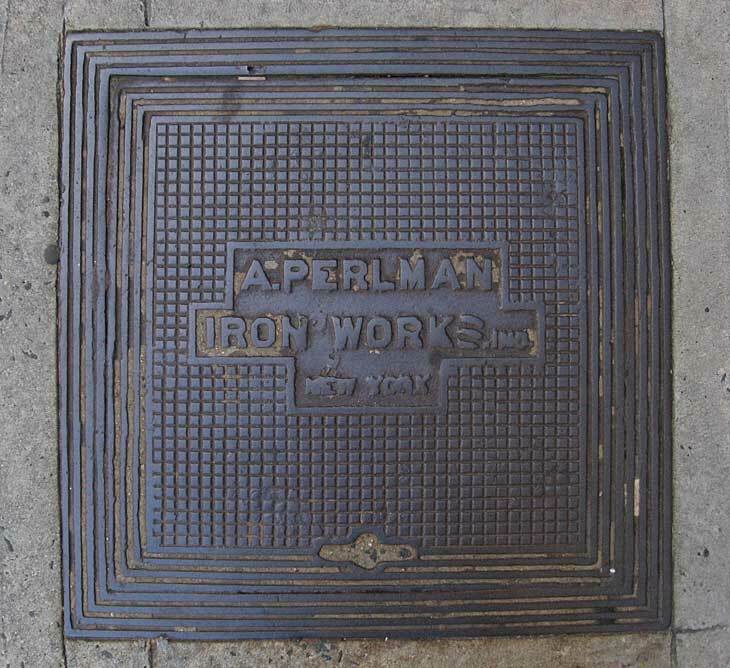 Other A. Perlman coal chute covers, virtually identical to the one above, can be found on East 90th St. and East 111th St.